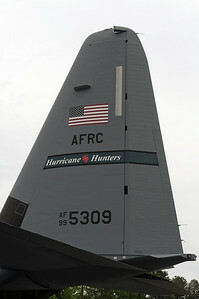 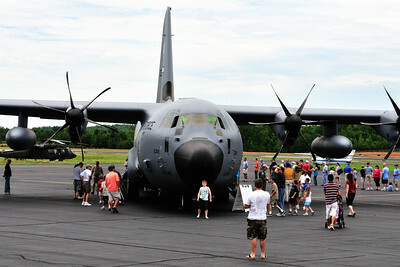 In 2009, a C-130J plane belonging to the 53rd Weather Recon. 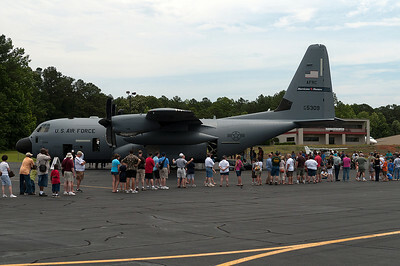 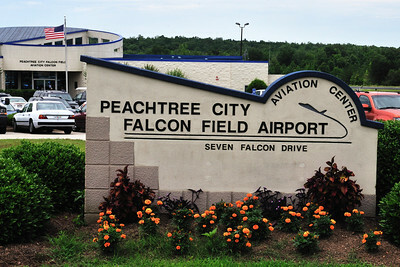 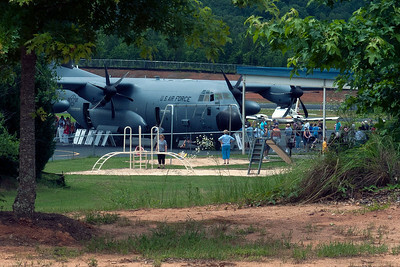 Sq., "Hurricane Hunt...ers" visited Falcon Field in Peachtree City, GA. 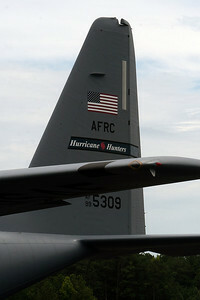 This is one of the Air Force Reserve Squadron's planes that they use to gather data on Hurricanes and other weather events. 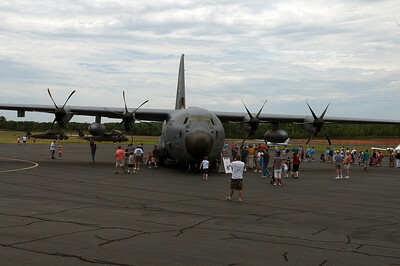 As you can see in some of the photos, there was a very large crowd of people who showed up to tour the plane. 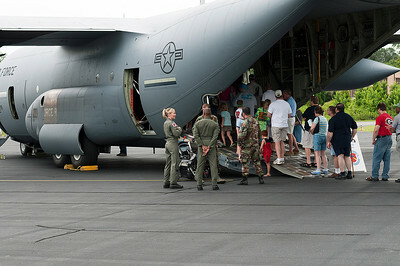 The wait to walk through the plane was about an hour and half, all day long. 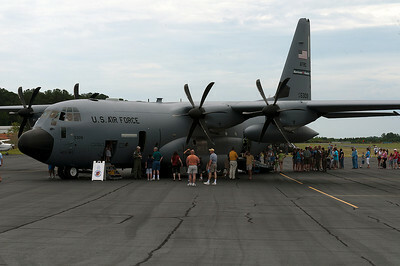 There was a long line of people all day, to tour the Hurricane Hunter. 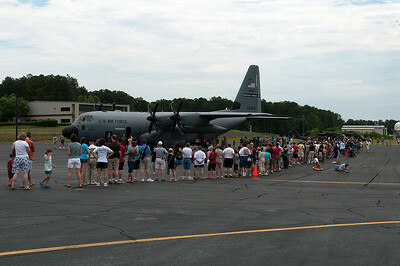 Most of the day the wait time was 1 -1.5 hours to get to see the plane. 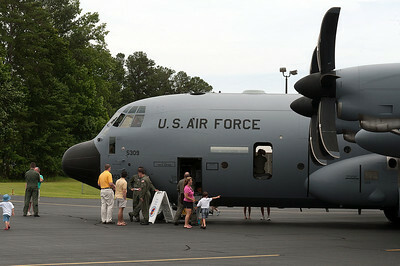 The fact that people waited that long shows how interested people are in this aircraft. 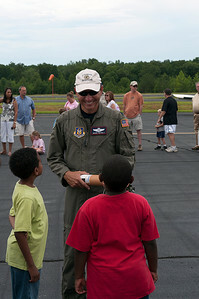 An Air Force Reserve Weather Officer talks about the Drop Drone with two young boys. 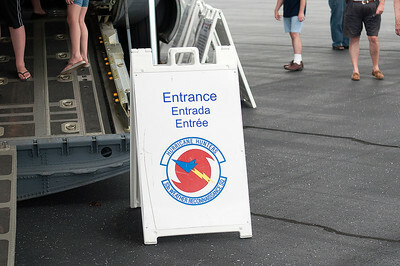 Entering the plane through the rear ramp. 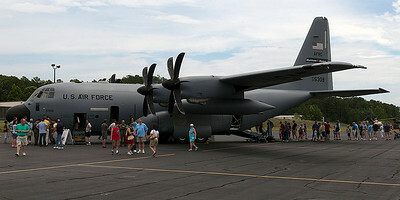 The famous Black Box is mounted in the tail section of the aircraft. 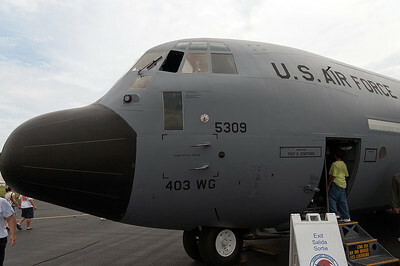 They bring plenty of coffee along with them for their 12-16 hour long flights. 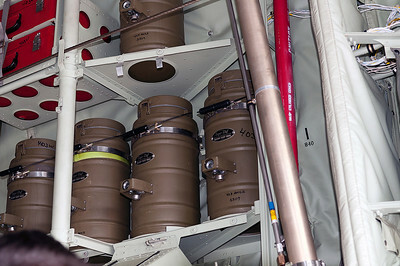 These brown jugs contain the coffee and water. 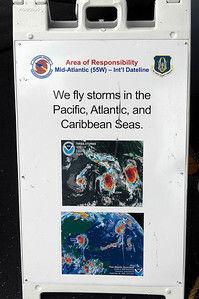 A Weather Officer, sitting at one of two weather stations, talks with the crowd about his job. 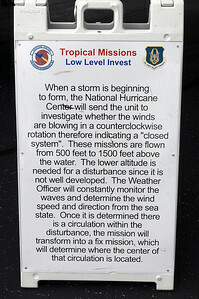 In the foreground is the Drop Tube, where the Drop Drones are sent into the storm to send back information. 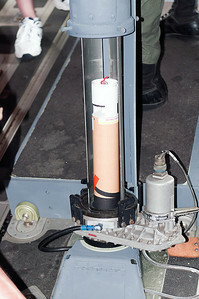 A close-up look at the Drop Tube. 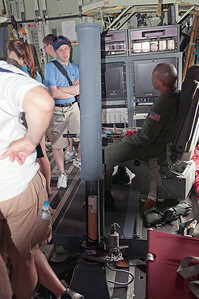 Sitting in the Drop Tube is a Drop Drone. 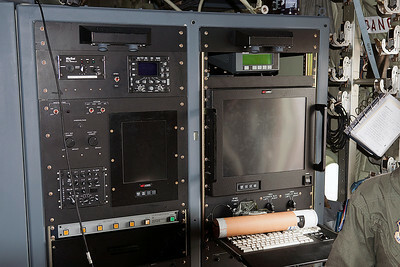 A close-up look at a Drop Drone. 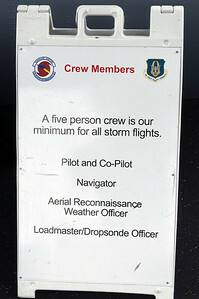 The Drop Drone is full of electronic data gathering equipment, that transmitts vital data back to the plane as it gently drops to the ocean. 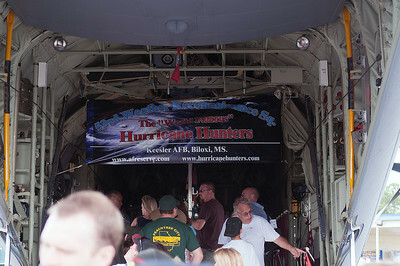 The red thing on the right is a tiny parachute that helps slow the fall of the Drop Drone from the plane. 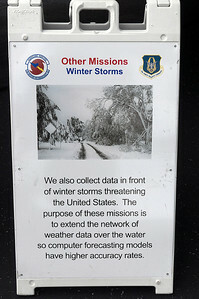 An Air Force Reserve Weather Officer holds a Drop Drone and describes what it does. 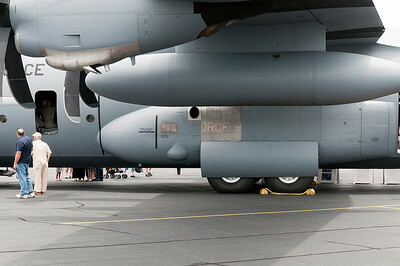 A close-up look at a Drop Drone. 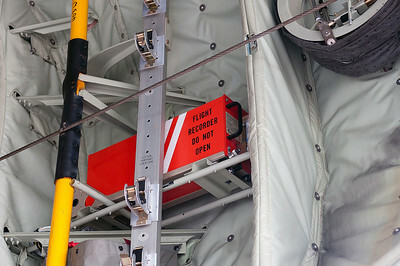 The Drop Drone is full of electronic data gathering equipment, that transmitts vital data back to the plane as it gently drops to the ocean. 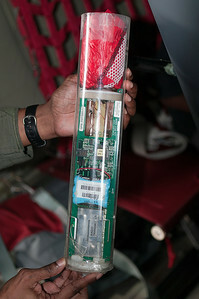 The red thing on the top is a tiny parachute that helps slow the fall of the Drop Drone from the plane. 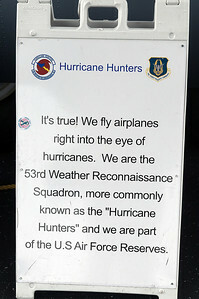 An Air Force Reserve Weather Officer. 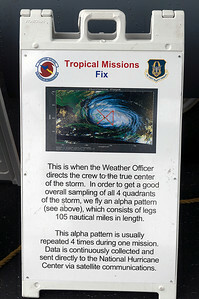 One of the two Weather Data stations aboard the Hurricane Hunter aircraft. 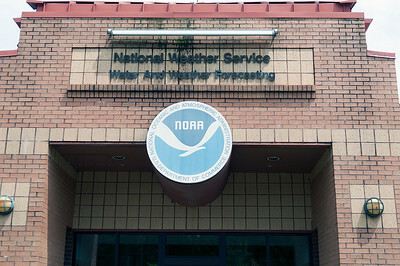 These stations relay information back to the National Hurricane Center.